Cliff Young, with the PBS television show Out To Eat, invites you to his Mt. SAC Food Truck Festival being held this Saturday (7/21) from noon-6pm (map). General admission tickets are $10. 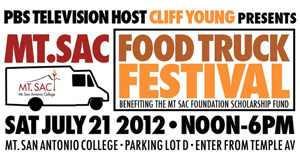 Over 30 food trucks will be serving!